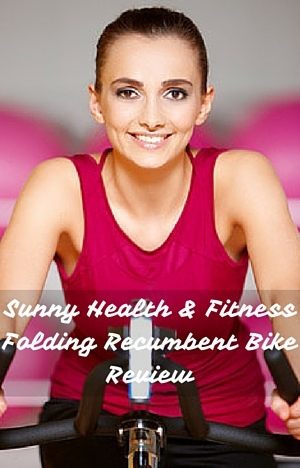 Sunny Health & Fitness Folding Recumbent Bike is a popular and highly rated pink folding exercise bike with some loving the color and some not so keen. It’s an affordable bike without much in the way of frills that doesn’t take up much room making it good for homes or apartments. It does come with a backrest to help in providing support to the back which can reduce the stress on it that you can get from sitting on upright bikes. Although the “cute” pink color certainly makes it stand out from other bikes it is not the only thing making it a good choice for people wanting to do more exercise in their home. There’s the price of course. But could there be more? And is there anything to look out for? In our review we look at whether you “get what you pay for” or can it really provide low impact cardio for those wanting to get into shape, to help in losing some pounds and just generally be more active. The bike despite its compact size and 36.8 lbs weight it is sturdy without any shaking or wobbling as you ride. The frame is made of steel and it feels steady under you. It doesn’t feel like it’s going to tip you off so you can just get on with your exercising. There is only a little maintenance required other than checking that everything is tight and keeping it clean. It should be used on level ground. If the floor is slightly uneven you level up the bike by turning the rear stabilizer end caps. People who have used the bike regularly for more than a year report that it is still performing well and they expect much more use out of it. The seat can be adjusted upwards/downwards on an angle to accommodate different heights. It is fairly straightforward to do this. So it can be used by multiple users. You loosen the adjustment knob and pull out the pop-pin then slide the seat to height you want, re-insert the pin into the pre-set holes and tighten up. The range of heights that customers seem to be able to use the bike comfortably are between 5 ft 3 ins and 6 ft but some outside this range have said they can use the bike comfortably and this is down to people having varying leg lengths at the same height. The company in response to a question have said the bike should adjust to allow people 4 ft 11 ins to use the bike with a comfortable fit. However, it seems there are a number of people below 5 ft 3 ins that really struggle to reach the pedals and this is due to their leg length. The company has said that people with an inseam of between 33 to 36 ins should be able to comfortably and properly use the bike. Some people have removed the backrest support that is fixed on the seat post just below the seat and this has given them some extra adjustment to lower the seat a couple more inches which has helped in getting into the right position for effective pedaling. It shouldn’t affect the integrity of the bike but isn’t something that has been suggested by the company. Of course, you don’t have the backrest nor the handrail to steady yourself on the bike and can’t use the semi-recumbent feature of the bike. They’ve also found thicker shoes can help too in reaching the pedals..
For the best pedaling motion it is recommended your leg should at full extension be slightly bent and not locked (for some reason this isn’t included in the manual). You can’t adjust the handlebars height or horizontal position. Resistance is controlled by the tension knob just below the handlebars. It has 8 settings marked. The settings go from very easy (almost none) to moderate hardness. You won’t get the toughest workout but you can work a good sweat all the same from these light and moderate settings. It’s not designed for intense workouts. Making the adjustments is simple to do. The knob is in easy reach – turning clockwise increase the resistance and counter-clockwise to reduce. At the higher settings (7 & 8) the pedaling motion will start to feel like it is pulsing as resistance slows the light flywheel (in the pink casing) at the top of the pedal stroke then speeding up as you push on the down stroke – it does add a little impact like you might get on a sitting down and using a stepper. It uses a belt drive which provides a quiet and smooth ride. It is all encased in the pink casing keeping out of the way of your feet, clothes, pets and children’s fingers etc. The pedals have a non-slip surface and straps to keep your feet from slipping off the pedals. The positioning of the pedals at an angle out in front of you and he overall design of the bike is such that isn’t made for standing on and using for spinning type workouts. It is a comfortable position for riding but it’s not for high intense cardio workouts. The flywheel is light so doesn’t have the weight to pull the pedals through for the momentum you get with spin bikes. Sunny do have a range of affordable indoor cycles that can be used for spinning workouts and other more intense workouts. The most popular version on our website is the Sunny Health & Fitness Belt Drive Indoor Cycle – it isn’t as quiet as this bike but it is still fairly quiet – you’ll hear the resistance pad on the flywheel making a shushing sound. Seat. The seat size is 9 ins wide and 11 ins long. Like a lot of exercise bike seats this is an uncomfortable seat. To help with this you can buy a gel seat cover and/or use padded bike shorts to help alleviate the issue. The way the seat is fixed to the seat post means it is not straightforward to replace the seat but it can be done if you can’t get used to seat. It involves buying a universal exercise seat adapter which allows you to then fit a standard bike fitting seat to it. The seat is about 33 inches off the ground (depending on adjustment) which can make it hard to get on to when below 5 ft 3 ins. Along with this is the need to get you foot over the x-bar which can be hard for those shorter in stature and those who have a hip issue may struggle too. A number of people use a small step beside the bike to help with this. The bike has been listed as a recumbent bike because the seat has a back rest that you can lean back against. It does give support to your back which can help if you’ve back problems. However, your legs are not out in front of you as you’d expect on a full recumbent bike. It is more a semi-recumbent position with the pedals out in front of you slightly but below the seat. The backrest is fairly upright and the angle can’t be changed so you can’t lean back that much but it can help in taking pressure from the back and getting into a more comfortable position as you want especially when riding for extended periods. The bike can be ridden as an upright bike holding the handlebar in front of you with the caveat that your legs are at an angle in front and down not underneath. It can take a little pressure off the knees but may put a little more on the glutes. Most people find it a comfortable position whether sitting and riding upright(ish) or leaning back on the backrest in the semi-recumbent position, with a warning on the bike seat which is the same as any bike seat – you may find it uncomfortable no matter what others say. Handlebars. As well as the handlebars at the front of the bike there is a handrail at the sides of the seat that can be used to steady yourself when you lean back. Both are covered to provide a more comfortable and better grip. Some people with wider hips do find that the handrails get in their way while pedaling as well when they are getting on and off the bike. The handlebars at the front do allow you to use a number of different grips while seated, you can have them from close in at the console to at the end for a bit of stretch and leverage at the end of the bars. Noise. It is a quiet bike with it able to be used when others are sleeping in the house or watching the TV without having to turn up the volume. It makes it a great option for using in an apartment or if you are on shift work and want to exercise while others are sleeping or vice versa or maybe want to tone up or exercise when your little children are napping. Dust and Dirt This bike shouldn’t add much to your chores other than wiping it down to keep it free of dust and sweat from the user. It is important to wipe down the sweat as this is corrosive and will damage the bike finish over time. Sweat may also drop on the floor and you may want to buy a rubber exercise mat to prevent damage to it. When folded up it will fit into a closet but it is too big to fit under most beds. Folding it up is quick and easy to do. You remove the holding pin at the center and slide the feet together and insert the pin to hold it all in place. Even when not folded up it doesn’t need that much room with a footprint of 19.5 by 32 inches. There are transport wheels in the end caps of the front stabilizer bar that you tilt the bike onto when you want to move the bike. They work well on hard floors but are not so good on soft carpet as they can sink in and the stabilizer bar drags on the carpet. The bike weight is 36.8 lbs so it can be a little tough to drag. The bike comes mostly assembled. To complete the assemble normally takes around 60 minutes. You are required to add the handlebars, handlebar post, handrail, seat, seat post, back rest, console and pedals. The tool needed to complete the job are included. The instructions included could do with being clearer but they are adequate for what is a fairly straightforward task. To help some of the hardware (screws and bolts) have already been put fitted to the components. The things you need to look out for is putting the pedals on the correct side so that the left pedal is tightened counter-clockwise. The console is basic. It measures time, distance, calories burned and speed. You can only read one of the measures at a time or you can set it to scan through them every few seconds. You do this using the mode button below the screen. The LCD screen is easy to read when used in good light. It isn’t backlit so can be hard to read in poor light conditions. You can start the computer either by starting to pedal or pushing the mode button. It will turn off automatically after 4 minutes of no activity. The measures, apart from time, are estimates and should be used as guide only for monitoring and comparing performance over time. The information can’t be uploaded or stored for tracking performance so you do need to do this manually. It doesn’t have an pre-set workouts so you need to source these yourself – either by just getting on it and pedaling away or fining them online etc. The console requires 2 AA batteries which are included. The bike is no frills with no accessories provided. If you want to have water as your exercise you need to set it next to you on a table – the same is if you want to watch TV – the remote will need to put on a table or bench next to you if you don’t want to hold it. If you are wanting to read a book or use a tablet you need to hold on to them when using them as you pedal leaning against the backrest for balance as needed or if upright you can balance them with your hands on the handlebars. The manual includes some general information about exercise that includes heart rate zone and warming up, stretching and cool down. There are no specific suggestions for beginners apart from taking it easy to begin with. if you’ve been inactive or you’re overweight. It does go through adjusting resistance but there is nothing on how to fit the bike to you properly in regards to how the leg should be when at furthest part of the pedal stroke from the seat for the most efficient pedal stroke. Customers like the bike and are surprised at the quality for the price. They like how they can get on it when they want and get their exercise done without disturbing others and watch the TV without turning the volume up. They feel secure on the bike. One thing that comes through in the reviews where people don’t like the bike is the amount of resistance being much less than they expected – it does only provide moderate resistance at the highest setting not like you’d get with a spin bike. The second thing mentioned is the seat and this is in the positive reviews too. It is not comfortable for the majority of people. This is a problem but can be solved with seat coverings in the most part. The company could also help with some issues raised in reviews by being more clear on the range of heights the bike is best suited for. This is an affordably priced bike with a backrest that pleasantly surprises with the quality of its construction. This does make it great for people wanting a way to get low impact cardio exercise in their life. When it’s compared to the cost of gym membership it doesn’t take long to get your money back. It’s a good bike for getting into shape, rehabbing (if doctor approves), helping to burn calories for weight loss, toning the legs and generally getting more activity in your life. It’s not a bike for high intense or tough workouts. It’s not designed for spinning type workouts. There are range of resistance levels that are marked from very easy to moderate. Riding motion is for the most part smooth (a little choppiness is experienced at hardest resistance settings) and low impact so as not to put strain on the knee joints. It has some features of a recumbent bike with a backrest and handrails but you are not in a fully recumbent position more a semi-recumbent with legs out in front but below the seat. It has so far proved itself durable for those using it for light and moderate exercise. It’s very quiet and space saver making it ideal for apartments, small homes through to large ones.